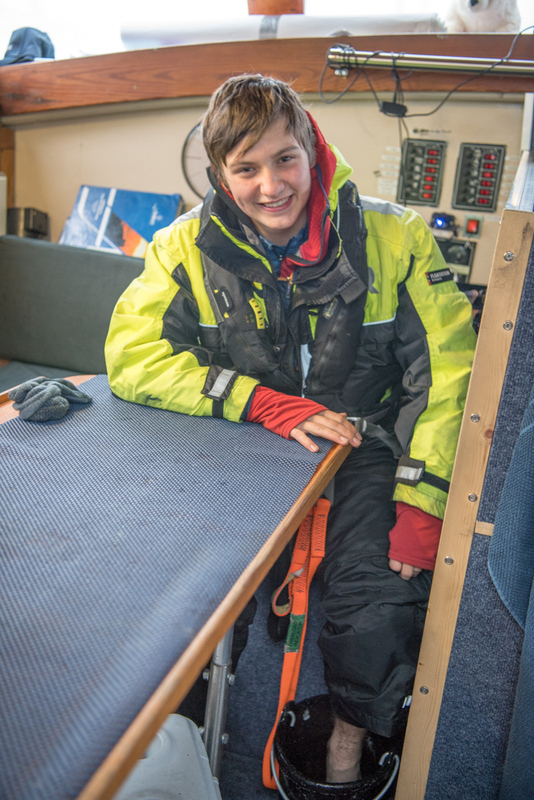 benedwardspolaroceanchallenge – Joining an attempt to sail round the North Pole in one season. Joining an attempt to sail round the North Pole in one season. The North West Passage is over! We’ve done it! The trip isn’t over yet but the difficult part is. While we aren’t done with the trip yet it does put quite a few records to our names. Nikolai’s the first skipper to do both passages twice, David and I are the first Brits to do both passages in one season and Constance and Barbara are the first women from their respective countries to do the same. Rather sadly however I just feel like we’ve crossed a line we drew on the chart plotter, which is of course exactly what we have done. It’s not the end that really completes the voyage in my opinion. You don’t really feel like you’re done until you’re in port. Luckily for us we’ll be in port in a couple of days. Our eight knot over the ground speed was sadly broken as we left the passage and we’ve had to reduce to six knots. Sad, but there’s nothing we can do about it. Last night we didn’t see any ice but because of my last encounter I was jumping at everything that looked white, waves breaking, sails an so on. Gladly we didn’t hit any ice. Or even see any ice. We are now past the pack ice area and into iceberg land. We saw a few in my morning watch yesterday but I hope to see more. I can’t wait to get to Upernavik. With luck that’ll be early on the day after tomorrow. Bye. Ice! just when we thought it was all over. For the past day we’ve had the wind and tide behind us, we’ve been doing nine knots at times. So of course, right at the end of my watch we come into thickish ice just as it’s getting dark. The next six hours were tricky. Weaving in and out, trying to find a route and occasionally gently nudging pieces out the way. We are now out of it again and moving swiftly on. But it seems the North West Passage wasn’t giving up without a fight. I do however have a new candidate for scariest moment of the trip. It was the last half hour of my watch. We were going at nine point two knots over the ground and it was getting dark enough that ing was getting tricky. We’d seen some pieces of ice earlier and so were looking out and has the radar on screen. I was sitting on the plank at the back of the boat and saw a wave breaking about thirty meters off the bow. I then noticed that the white on the water wasn’t going away, I grabbed the torch we keep up there and turned it on, there was a large piece of ice twenty five meters off the bow that we were heading for at nine knots. I jumped down to the wheel, hit the standby button and yanked the wheel sideways. The boat swerved quite wildly and we missed it by ten meters or so but I noticed I was now jumping at every breaking wave I could see. If we’d hit that we would’ve damaged the hull quite badly and I was distressed at how close it’d got before I’d noticed. I but the auto pilot back on and got David up, I explained the situation and said I thought we needed two people on deck. He agreed and soon enough we were seeing wave crests that turned into ice chunks and were using the torch. Barbara came up at that point and I went to bed, but I was a little worried I’d hear a nasty thunk and we’d have to get off in a hurry. This, happily, turned out not to be the case. The system devised a little later was one person would be at the helm and one at the bow with the torch. The helmsman would then see as the torch was swung around and do their best to not hit the ice. Luckily we can’t see any more ice in front and there’s a chance we’re through all the ice. According to the nav system we’ll get into Upernavik on the fourteenth. We’ll see how it goes. In the meantime I have a watch to go on, bye. We saw a grand total of seven small floating ice chunks. I hadn’t already been through the North East Passage I might wonder what all the fuss was about. A grim testament to greenhouse gasses. We’re through the Bellot Strait! It’s an almost completely straight passage between two islands lasting eighteen miles and cutting a huge section off the journey. It almost always has ice in it but as we went through today it was completely clear. It’s odd, hundreds of people died trying to find the North West Passage. Caught by ice and storms they either froze or were shipwrecked. And we went through seeing a grand total of seven small floating ice chunks. If I hadn’t already been through the North East Passage I might wonder what all the fuss was about. A grim testament to greenhouse gasses. The strait is very odd, the surrounding geography suggests that it really shouldn’t be there. I suppose it’s like phosphorescent algae, it doesn’t care about normal. Now that we’re through there something would have to go really spectacularly wrong for us to fail to complete the trip. There is still time though. There’s some ice north of us that we might have to go through. Hopefully not though. While we were in the strait we put the drone up. The Father was flying, he’s much better than me so it seemed sensible. When he first took off things went wrong immediately. Because we were moving he had to get the drone away from the boat as quickly as possible. He didn’t manage to and the drone collided with the windshield in front of the cockpit. The rotors smashed themselves to pieces and the drone upended itself on the deck. Not a good start. Very luckily non of the motors were damaged enough to stop it flying so we put some new rotors on and took it up. The Father managed to get it away from the boat this time. He got some really good footage and we managed to get it back on the boat safely. All in all, a success. I’m afraid sleep is calling so I’ll go now. I’ll write again soon. Not long till the Passage is over, bye. Well we’re a bit further on now. Last night I completely failed to feel tired whatsoever, and am as a result, exhausted now. The night itself was very nice. I spent a little time in the cockpit during Johans watch, there were no clouds so the view was amazing. I don’t get a night watch so I haven’t seen the night sky in weeks. Something else that is quite curious is that we have phosphorescence in the water. This means that there are little glowing green bits in the wake of the boat that are quite pretty. It’s unusual to get it in such a cold place but apparently phosphorescent algae doesn’t care what’s normal. I like its style. We’ve got a bit of a headwind at the moment which is slowing us down. What’s even better is this headwind is northerly. And given where we are that means it’s very very cold. I’ve just come off the most uncomfortable watch yet. Because we’re heading north our progress east has slowed to a crawl. We are however now less than a hundred degrees from home. Almost three quarters round. Whoo. If we’re lucky, and so far that’s been common enough, we’ll get to Greenland in five days time. Until then, business as usual, bye. One word, grrrrrrrrr. You know I told you about my ankle yesterday? And how I was restarting the physio? Well. I did that, in fact, I rather overdid it. I have damaged my ankle, any movement of it causes pain, and not the,ind of pain that says you’re doing the right thing it’s just uncomfortable. Pain that says you’re damaging it even more stop now you moron. I am not completely incapacitated, I can still do my watches, but putting sails up and down and things are definitely out. I’m not getting off, just to reassure any of you that were getting excited. I’m going to continue but I’ll need to be careful for the next few days and then follow the physio regime religiously. I feel I should apologise to Rob and the rest of the gastro team at Addenbrook’s for having a medical problem on this trip that’s completely unrelated to my gut, which as you know, I’ve been causing them grief about for years. Sorry. To combat the swelling in my foot I’ve been getting buckets of sea water and putting my foot in them for two or three minutes. While this has had a huge effect on how stiff that foot has been the water has been just under two degrees and therefore the treatment has been more uncomfortable than wearing a wetsuit full of sand, trust me on that one. In the meantime we’ve been moving along and came across the only other boat we’ve seen in the North West Passage. About sixty foot long and obviously built for very tough conditions we passed the motor yacht Polar Bound on its way to Antarctica. Sounds odd but apparently they’re going through the North West Passage the other way and are then going to go down the Pacific to Antarctica. Good luck. You remember how earlier on this leg we were consistently doing over eight knots? Well that situation has changed somewhat. The wind came round onto our bow a while ago and we started getting waves against rather than with us. The upshot of all that was that now we’re doing an average of four point three knots over the ground, yay. Luckily this isn’t supposed to last long. In the next nine hours or so it’s supposed to come round to the south, at which point we’ll be able to speed on ahead like good little people trapped in an aluminium tub thousands of miles from home. About two weeks before this trip started I was at a paragliding festival in the Lake District. During this festival I managed to roll my left ankle in a very painful manner. There was a man from Mountain Rescue with us who had a look at it. By that time it looked like someone had tried to inflate it with a tyre pump. This man told us he thought it was broken so The Mother had to take me to Whitehaven Hospital. Some x-rays were done and it was proclaimed that I’d been lucky enough not to break the joint and had instead merely torn a ligament. For this I was recommended total rest for a couple of days before occasional short walks followed by physio and so on. I wasn’t allowed to run for three weeks and my foot was large enough not to be able to fit in my shoe for a week. Because of unfortunate timing I was on the boat before this process had finished, it also seemed as if the ankle had healed properly, I didn’t get any pain from it waling around and so on. Then, two months later we arrived in Tuk and I discovered just how not healed it was. It was so much weaker than my right ankle that after a couple of hundred meters it would hardly support me. I have now gone back to doing the physio for it. This is of course very irritating but I’ll hopefully have it strongish again by the time I get home. I certainly hope so, a reoccurring torn ligament would put a stop to all the sports that I do. You cannot trampoline with a weak ankle. That’s it for today. I’ll write again when I get the chance, not long till the passage is over now. Not long now. Bye. We’ve slowed down a little, that’s about it. Because of the North East Passage it has become quite common for me to be lying in bed absolutely convinced that I was at the helm. “Okay.” And then I turn over and go back to sleep. It happens surprisingly often. I wish it wouldn’t. That’s all for today. I’ll write to you again when something interesting happens. Or we get to Upernavik, whichever happens first. Bye. If there’s one thing this trip has taught me, it’s how to wait. So we left Tuk yesterday. As usual we left during my watch. It’s extraordinary, the only time we’ve left a place not on my watch was when we left the stamukha for the last time. I assume there must be some kind of conspiracy against me, possibly the CIA. So far we’ve been very lucky, we’ve had following winds ever since we left and have been doing over seven knots most of the time. We’re at one hundred and twenty six degrees at the moment, when we reach one hundred and twenty we’ll be two thirds of the way round. Exciting prospect, we’re almost done. In light of the lack of ice and in the spirit of saving time we’ve decided not to stop in Cambridge Bay or Pond Inlet and go straight on to Upernavik in Greenland before doing our crew change. Looking at the ice maps at the moment it seems we’ll be able to get through with little or no trouble, though this is almost bound to change, if it stays that way we’ll reach Upernavik in about fourteen days. I’m looking forward to it! As we’ve gone east over the past two days things have been getting much colder remarkably quickly. The water temperature has dropped by five degrees and though I’m not sure of the numbers for the air temperature it certainly feels a lot colder. If there’s one thing this trip has taught me, it’s how to wait. Not patience mind. I’ve never been good with patience, as far as I’m concerned there’s almost always something else to get on with while you’re waiting. Just sitting patiently comes across as a waste of time. What this trip has taught me is when you’re on watch, other than looking out for ice and so on, there is very little else you can do that’s constructive. As such I have found two pastimes that really help occupy you through your dull uneventful watch. The first is trying to remember songs. I tend to remember tunes rather than words in songs, so for any that I know the tune to it can be quite fun reconstructing the lyrics and then trying to alter the tune to improve it. That doesn’t happen very often I’ll admit. The second is words. I’ve done French Spanish and Latin in school and I know the occasional word in a number of other European languages and while Latin is more or less useless in real life it is very helpful for working out the roots of words. For instance: supercilious, meaning to feel superior. Latin derivative, superciliosus, meaning haughty, from supercilium, eyebrow. From this, super, Latin, above, cilium, one must assume eye. From the Latin the possible original meaning of haughty( superciliosus) means above the eye. Could be interpreted from there as looking down on so supercilious: above the eye, capable of looking down. Most of that is probably rubbish, I’ve almost certainly misremembered something or taken it to its illogical conclusion but at least it keeps me occupied. My watch has just finished and I’m feeling cold and tired so I’m going to go and sleep now, I’ll write again when I can, bye.